"With Needle and Thread, Precious Lives We Hope To Mend." I will be displaying the quilts on Saturday, June 18th at Vikki Clayton's Needlework Exhibit in Williamstown, PA from 10-5. For more information, visit Hand-Dyed Fibers. I hope to see you there! I was invited by Mary Fetchet, Founder of Voices of September 11th, to bring the 9-11 Memorial Quilt Project to New York City for the 5th anniversary of 9-11. It was a wonderful and meaningful visit. The family members were so warm and kind. I've already been invited back next year to share the quilts again. You can see pictures of my visit to NYC in my Webshots Album. We also stopped by Shanksville on our way home and took some pictures there too. Here's the link to that Webshots Album. Click on the flag for a free chart. Photo collage courtesy of J. Larry Walker of Creation's Kisses. Our lives were changed forever on 9-11-01. On 9-13-01 I felt led to start this quilt project. What started out as one quilt has turned into five. One for the World Trade Center Memorial, the Pentagon, the Somerset County, PA Memorial, the FDNY and the NYPD. The end result consists of 5 quilts containing 524 squares from 47 states and 14 countries. I am currently exhibiting the quilts before they take up permanent residence in their respective areas. They would be sitting in storage in PA, DC and NY until the memorials are built anyway, so this will allow many more people to see the project. Thank you for your continued support and God bless. What quilt is my square on? Check out this alphabetical list. Where are all the stitchers from? sorted by each of the 5 quilts. When you think of quilts, you think of something warm to wrap around you and give you comfort. That's what we hope to accomplish with this project. We want everyone touched by this tragedy to know that the world is trying, in some small way, to give comfort to them in their time of need. Our hearts go out to those who lost family, friends and co-workers in this terrible tragedy. When I helped coordinate the Columbine High School Quilt Project, I hoped that another tragedy like that would not occur, one that would even require us to think about another quilt project. But it has occured and the people of the world will rise to the occasion and do good instead of evil in so many different ways. In haste, I entitled this quilt project the "World Trade Center Memorial Quilt", but it will encompass all of the areas of our country affected by the tragedy. There will be quilts made to be given to NY, DC and one to remember those lost in the PA crash. Also, I will make quilts for the NYPD and NYFD. GOD BLESS you for participating! It wouldn't be possible without wonderful, caring stitchers like each and every one of you! 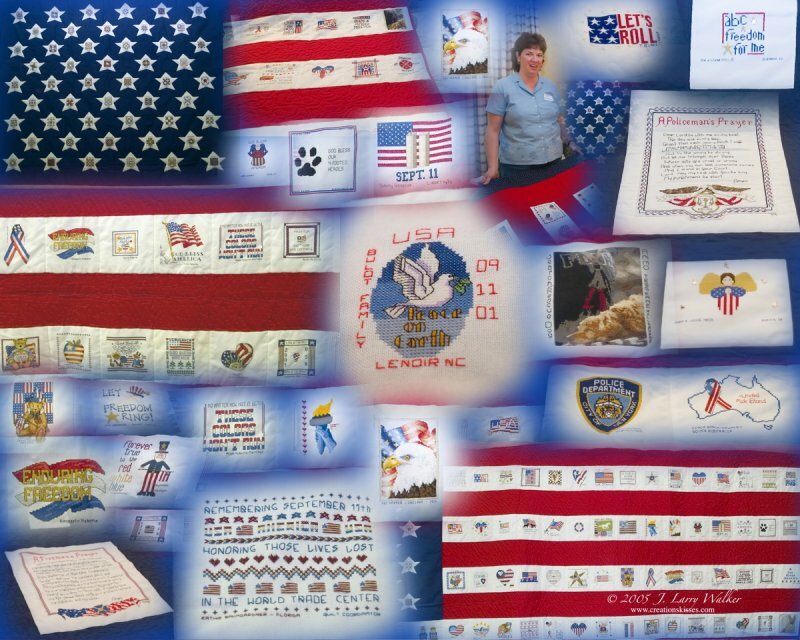 Email 911 Quilts if you have questions or comments. putting your email address in the box below. Logo Photograph courtesy USA Today~by Thomas E. Franklin~The Record.